I was recently contacted by a representative from a Chinese company that sells Bijia binoculars, not only to China, but pretty much the whole world. Now, I'm guessing like many of you, I had never heard of the brand, let alone used one of their instruments. However as the quality of optics from this part of the world continues to improve, closing the gap on those manufactured in the US, Japan and Europe, I was interested. Bijia Optics Technology company is according to their website a very well recognized brand within China, indeed they proudly announce it as being within the top three! As their name suggests, they specialize in producing all manner of optical instruments, that include microscopes, magnifiers, monoculars, telescopes and of course binoculars. 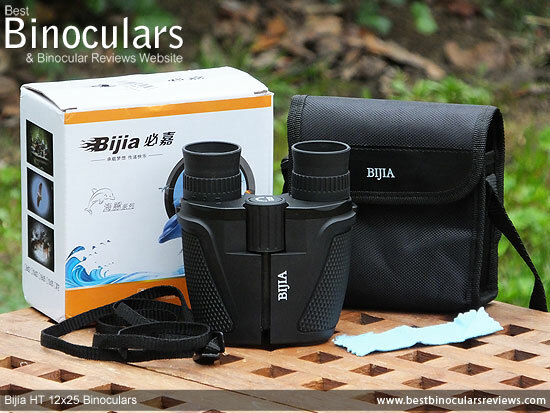 Whilst they produce a large selection of binoculars, Bijia tends to focus more on the entry level market, with a few specialized exceptions like their military and marine binoculars. Even so these are not what you would describe as being very high end optics. Night Vision? 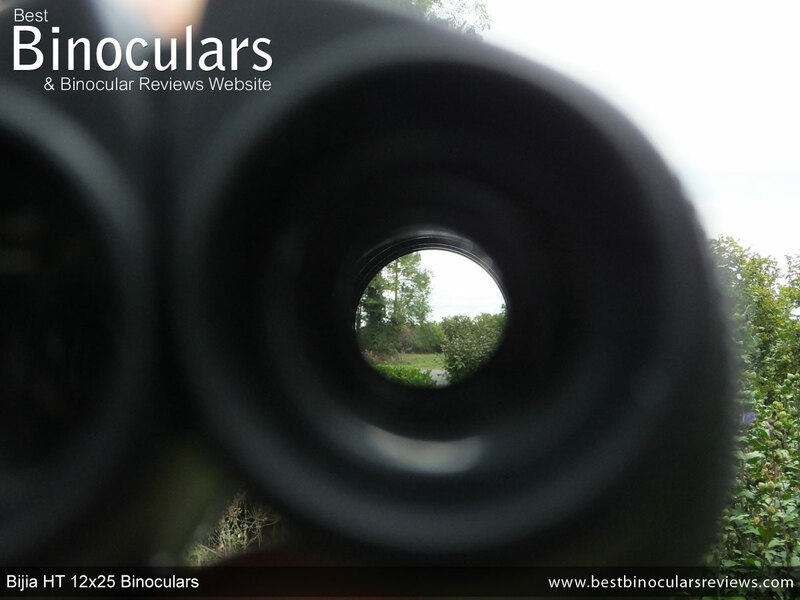 - Before testing and writing any binocular review, I spend a good amount of time researching the product on the web. 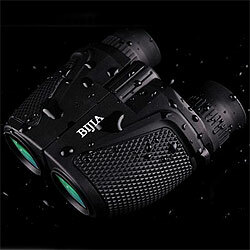 One thing I immediately noticed with these Bijia's is that they are often advertised as BIJIA 12x25 Waterproof Ultra-clear High-powered Night Vision Binoculars - Now I can agree or at least not completely disagree with most of that title, but to say that these have night vision is a complete misrepresentation of the product as in no way do these help you see any better than normal bins, be that in the dark, or even just poor light conditions. Yes they do have a green colored coating on the objective lenses, but this in no way magically make them see in the dark! To be fair to Bijia Optics, they do not mention this on their website and it is only through some really badly informed and ignorant marketing that this false information has spread. If you are interested in being able to see in the dark, please do not buy these, rather first take a look at my section on Night Vision which explains what is available, how they work and products that I have tested. Advertised as having a Height and Width of 11.3x11.15cm (4.4x4.4in), for me it makes more sense to say that they have a Length of 11.3cm (4.4in) and a Width of 11.15cm (4.4in). I also measured their Depth (Height) as being 5.2cm (2in). 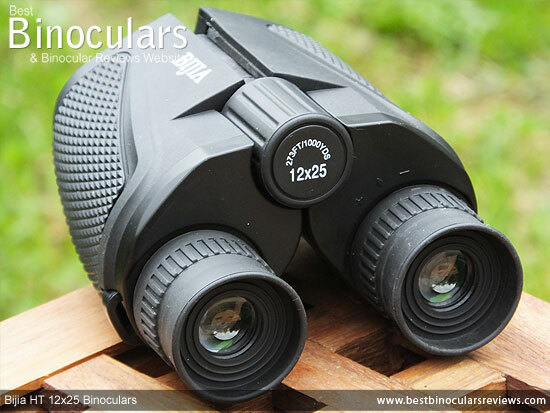 Whilst the porro prisms used in these Bijia 12x25 binoculars have the advantage in that it is easier and cheaper to make them perform at a good level, their actual shape and the way the light exits at a different plane than what it enters makes it impossible for the manufacturers to make a binocular that is as small (especially when folded) than those that use roof prisms. For example compare the folded sizes of these Bijia binoculars to the double hinge roof prism Steiner's in the image above. 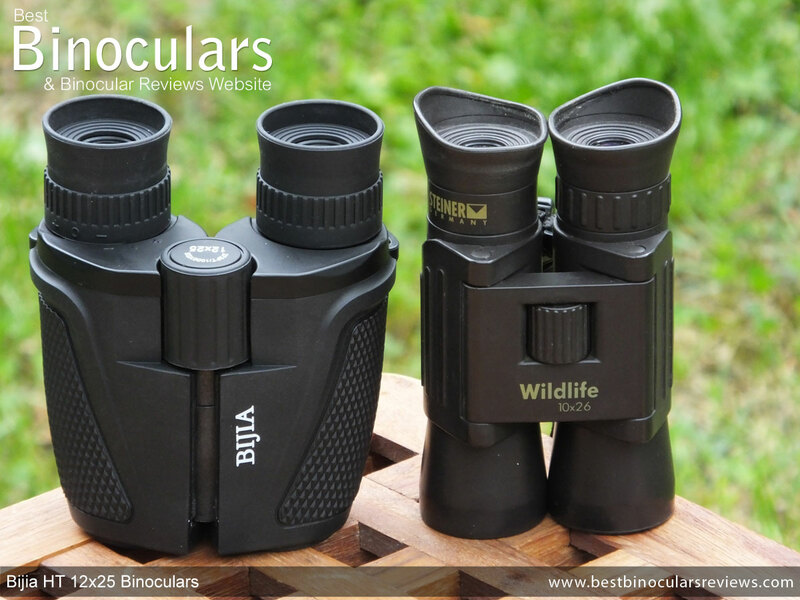 For more details take a moment to read this article on the Best Compact Pocket Binoculars. No problem with their weight as 9.9ozs (281g) is good, even for a compact. There is no mention as the material used in the construction of the chassis, but considering their price and just how lightweight these are, I will assume that it is a Polycarbonate plastic. Whilst this may not be quite as luxurious or as strong as more expensive materials that are sometimes used like magnesium or aluminium, the chassis on these Bijia's does not in any way feel particularly flimsy. So unless you subject them to some extreme forces, it should be more than fine in terms of strength. Covering most of the exterior, including the underside is a really thick and hard rubber coating. This offers plenty of protection and because of the excellent textured surface on the edges, it provides you with a great non slip surface to hold onto. Bijia Optics make no mention as to their actual waterproofing on their website, but most of the sites selling these say that they ARE waterproof. However the majority of these also describe them as being night vision binoculars! One thing is that some of the official photographs of these (see right) depicts them with water over them, which to me suggests that they are either fully waterproof, or at this price they are more likely to be water protected (which is what I have use for their scoring). In either case they will probably be fine in light rain and the seals should prevent dust from entering the insides even if they are not completely airtight, but I would not take them swimming! With no mention to them having any dry gas interior, I will assume that they are not fog proof and score them as such. This means that in some situations, like for example when you exit a warm house on a cold morning, there is the possibility that some moisture will form on the inside lens surfaces. 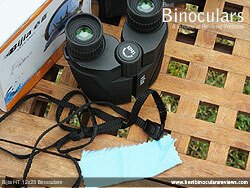 These Bijia 12x25 binoculars have fold up/down eyecups made from rubber. For a compact in this price range this is fairly typical and whilst they are comfortable enough, this design is never going to be as good as a well made twist up/down eyecup in terms of being able to accurately adjusting the distance of your eyes to the ocular lens to get a full view. Most binoculars have a diopter so that you can calibrate them to allow for any differences in the vision of your left and right eyes. 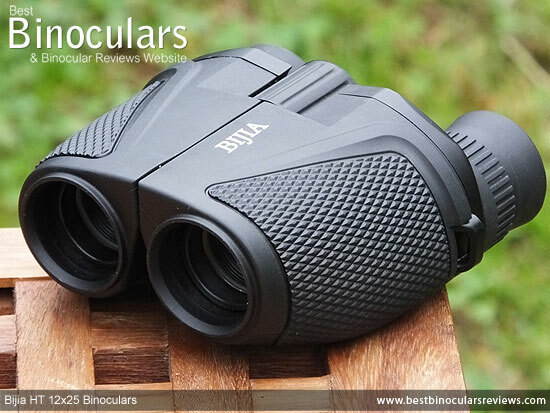 On these Bijia binoculars this is accomplished by turning the right eyepiece, which is a little different to most that have a separate adjustment ring. As it has no way of locking your setting and as the eyepiece comes into contact with you face, there is more chance than on most of your setting being accidentally moved, but other than this point the actual adjustment worked well enough. 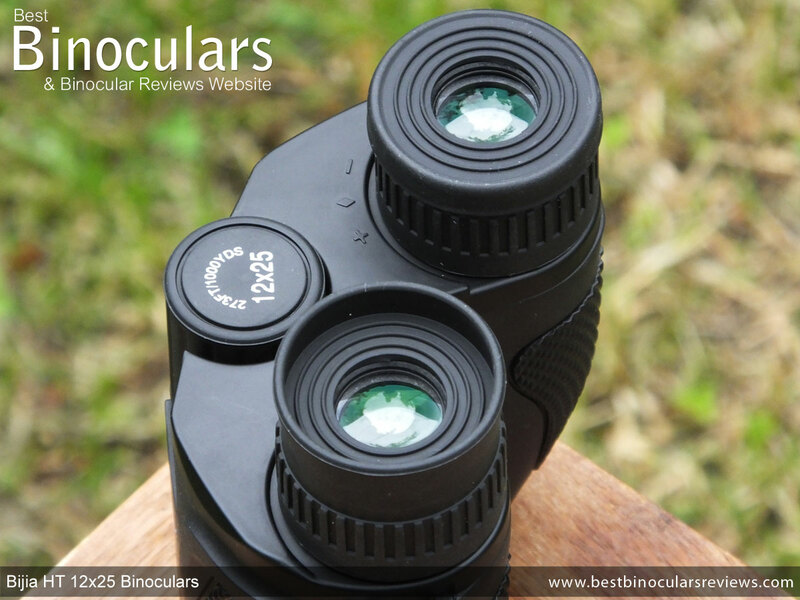 At 24mm in diameter and 27mm long, the focus wheel on these Bijia 12x25 binoculars is fairly typical in size for a compact bin. However much of the wheel is encased in the main body housing and so a little less prominent than on many. As it is easy to reach, for the majority of the time this will not be an issue at all, however in winter with thick gloves on your hands, it is just a little harder to "fee" and thus be able to make quick and accurate adjustments. Taking about 2¼ turns of the wheel to go from maximum focus distance to the minimum, I would describe these as having a low geared focus mechanism. The advantage of this is that it makes fine focus adjustment easier, but on the flip side, it takes longer to make big adjustments than on those which take less turns. Other than to say that the objectives have a 25mm diameter and that the oculars are 16mm in diameter, I can't really expand as no information is given. What I can say is that these use reverse porro prisms to turn the image upright. Whilst it may not be as compact, this design of prism is both relatively cheap and is simple to make as you do not need the same level of tolerances or the extra coatings to produce the same level of optical performance as that of a roof prism which is why it is a popular and usually the best choice for a cheap binocular. The Bijia website states that they have used BAK7 glass as the prism material, which I will take to mean that they have BK-7 glass. Once again some retailers advertise them as having BaK-4 glass, but this is not the case. At this price point, BK-7 prisms are common, but due to them having a lower refractive index, they have a lower transmittance level and thus the image tends to be less bright and not quite as sharp around the edges as those that are made from BaK-4 glass. 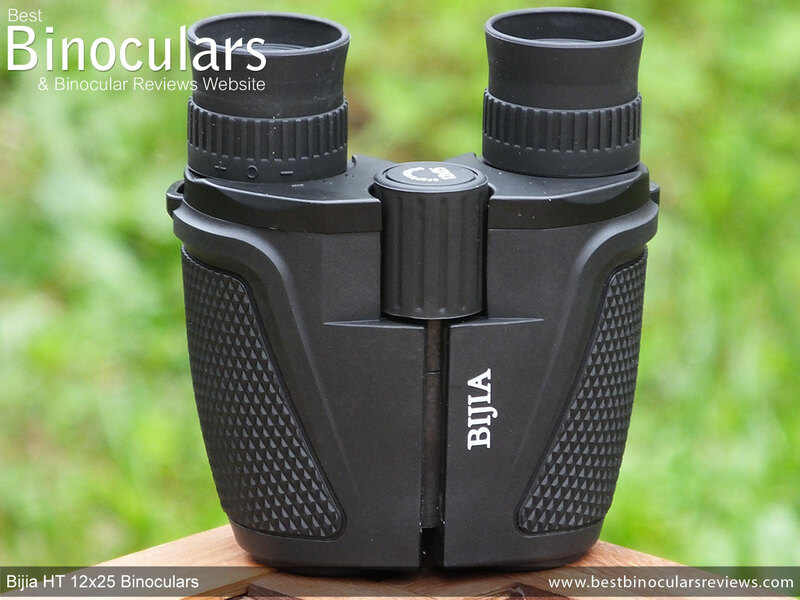 The only mention of coatings on these Bijia's is that they have a "Green Eyepiece and Objective lens coating". This green color is where some sites have mistakenly referred to these as having some sort of night vision, but is simply an anti-reflection coating which is coloured green. I have read that this particular coating that they have used gives these lenses a transmittance level of 99.5%, which is good, but remember it is only these exterior lenses that have been coated on this 12x25 HT. 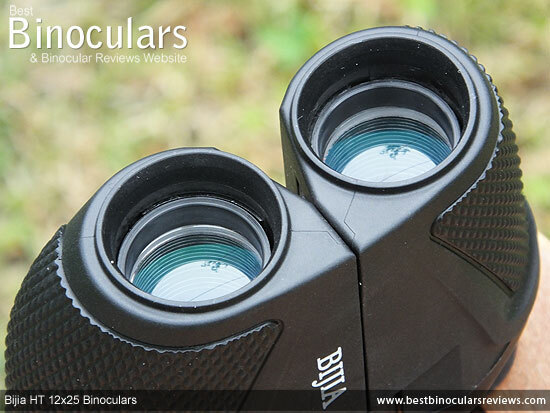 The best binoculars are fully multi-coated which means that every single glass surface throughout the entire optical system has multiple layers of an anti-reflection coating which means that they will most probably have a far brighter and better quality image than single coated optics like these. At a distance of 100 meters away, the view on these 12x25 binoculars is 91m wide (273ft wide at 1000 yards), which considering their really high 12x power is not at all bad, but it is quite a lot narrower than most 8x and 10x compacts. For example the Swarovski CL Pocket 8x25 has a FOV of 357ft@1000 yds and even the 10x25 Vanguard Orros has a FOV of 330ft. So whilst you get closer to your subject with these, the narrower view makes it harder to find what you are looking for and in some situations, you can only see part of the whole picture and you have to pan around. 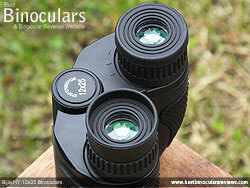 Optics is all about compromises and deciding what is best for your particular needs and uses. 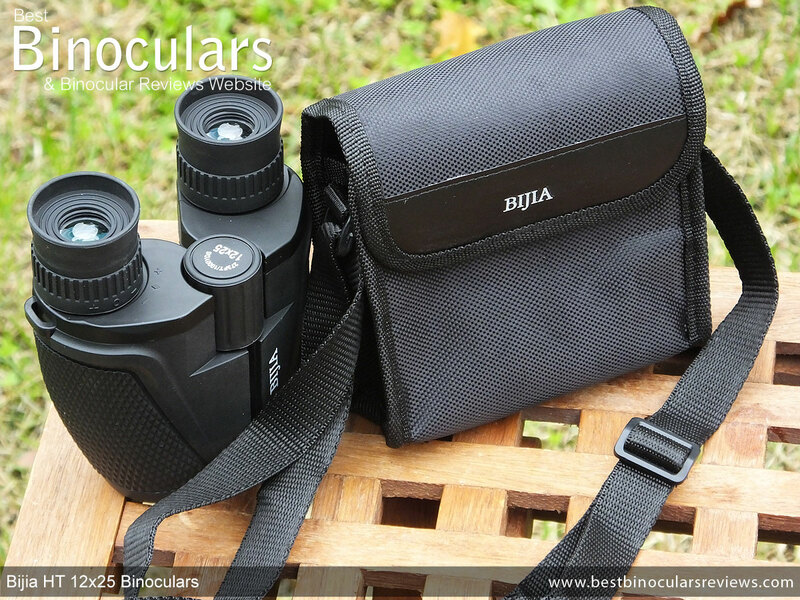 Bijia Sport Optics make no reference to their official close focus distance on the specification sheet or indeed on their product description. I measured this distance to be 2.15 meters (7.1ft) on my sample, which is not terrible, but is a little longer than than some of the better close focusing compacts out there. It is for this reason that I would not recommend these as the ideal choice if you were looking for a bin especially to view butterflies or other objects from closer distances. If this is the case this section on close focusing binoculars should help. With their powerful 12x magnification and small 25mm objective lenses these produce a small 2.1mm (25÷12) Exit Pupil. 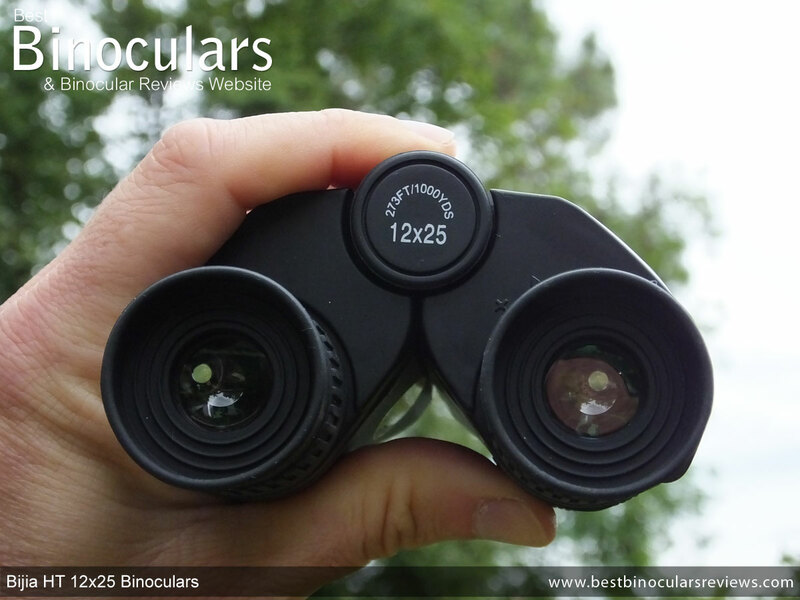 If you compare this to an 8x42 binocular, with it's much larger 5.25 exit pupil or even a more standard 8x25 compact with a 3.1mm exit pupil, it is understandable that thee are not ideal bins for use in low light conditions. For more on exactly why this is the case, take a look that this article on the complete guide to the exit pupil and low light performance. With only 10.3mm of eye-relief these do fall a little short when compared to the best compacts in this area and thus may not be the ideal option should you want to wear your glasses whilst binning. For everyone else, this amount should be no problem at all and I experienced no problems like dark rings on the view edges during testing. One thing I would like to mention here and it is a first for me. Whilst there is always some minor variances, I really do have my doubts as to the fact that my sample Bijia 12x25 actually had a 12x magnification. Firstly when looking through them, the view to me looked no more magnified than that of my 10x controls. Indeed if I had to pick one, I would say that the my 10x26 was actually slightly more powerful. Secondly looking at the size of the exit pupil, on my sample I measured it to be about 3mm in diameter, when for a 12x25 configuration, it should have been 2.1mm (25÷12)! Now I cannot say if all Bijia 12x25 are the same, but my guess is that the pair I was testing had a magnification of around 9x. Whilst perhaps not quite as vivid as my control, I thought that in general the color reproduction was good in that the image looks natural and I never noticed any sort of tinting. 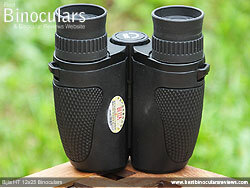 This is good as it is common for cheap binoculars to exhibit a yellowish tint due to the use of lower quality glass. Likewise the levels of contrast felt normal and there is a nice graduation between the darkest and lightest areas. I was really impressed to see that even in poor lighting conditions when I compared them to my controls at and just after sunrise on a dull and cloudy morning, these seemed to be equally as bright. 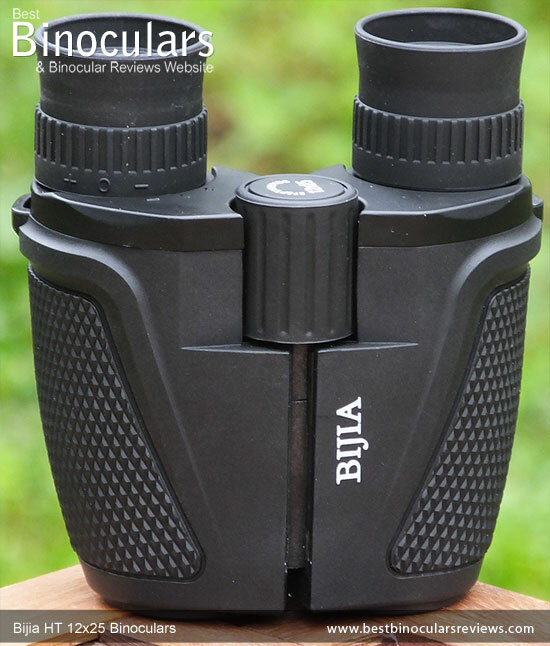 If you consider that not only do the Bijia binoculars have less anti-reflection coatings on their optics, slightly smaller objectives, but in theory also a higher magnification and thus in theory should produce a smaller Exit Pupil this is really super impressive. Although if we say that my sample Bijia actually has a magnification of around 9x (which is my estimation), whilst the brightness is still as impressive, it now also starts to make more sense. The levels of color fringing were more than acceptable and thus these do a good job of keeping chromatic aberrations to a minimum. I also did not detect any other obvious deformities in the view and once correctly focused was very sharp and looked perfectly flat. whilst not quite as good as the best, the amount of softening at the edge of the view was also very minor and more than acceptable. Made from a woven nylon fabric, the very basic soft case is only very lightly padded and so whilst it will protect the instrument inside from scratching, dust etc, it will not help with heavier impacts. It comes with a Velcro fastened flap with the Bijia logo sewn onto it. The binoculars fit comfortably inside and are easy to take out/replace. The case also has it's own shoulder strap that can be adjusted for length with a slider. 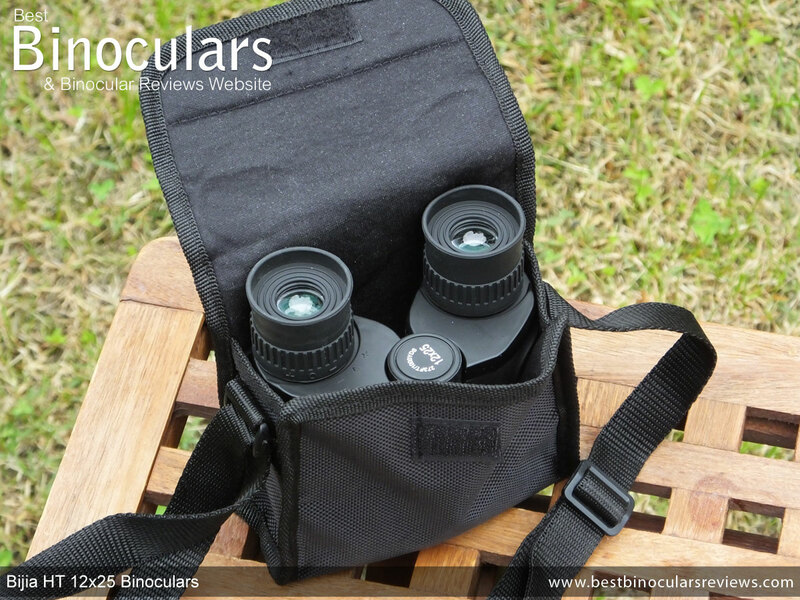 The included strap is about as basic as it gets, just a simple nylon cord that you thread through the eyelets on the sides of the binocular and then back on itself through a couple of sliders. As is normally the case with a compact, especially a cheaper porro prism one one, these lack any extra objective or eyepiece covers and you simply use the carry pouch to keep them away from harm. Rather incredibly at this price level, these do still come with a cleaning cloth and whist it is not a high end and specialized microfiber lens cleaning cloth, it is still useful for cleaning the body and if you are very careful, to lightly dust off the lenses. However you will still be best off with a lens cleaning kit, although in some cases these will cost more than the actual binocular! Also included within the box were a rather simple instruction manual and what looks like a guarantee card. However both were written only in Chinese and so I can say much more. I think what is a little surprising for me on these Bijia 12x25 Binoculars is that if you consider just how little they cost, as a package they are really not bad at all and to be honest before they arrived I was expecting much worse: Most binoculars I come across at this level are truly bad and if you throw in an ambitiously high magnification, I was sure that it was all going to go terribly wrong. Well this is not the case with these Bijia's and whilst it is true that they are a long way off competing with higher end products, the are usable and at this price these are in my experience one of the better compact binoculars that I have come across. I would like to stress again however that my suspicions are that my sample pair had a magnification that was nearer to 9x than 12x, which to be honest I think is a good thing! Strong Points: For me these have two major strengths that are linked together, the first and probably most importantly is their extremely low price which is almost unbeatable and then keeping that in mind it, the second is that it is super impressive that they really do not have anything so bad on them that would make them completely unusable or undesirable. I mean they look and indeed feel far, far more expensive than they are, their eye-relief, close focus and field of view, whilst not class leading are far from being deal breakers. I also thought that whist they do not have any sort of night vision, they do produce a reasonably good quality and bright view, and were just as bright in poor light as my much more expensive 10x26 compacts. Weak points? As I mentioned in their strengths, there are no weaknesses on these that are extremely bad. 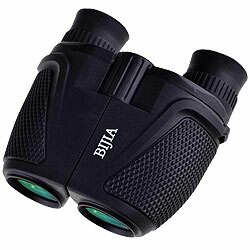 However there are a number of areas where compared to higher end products these Bijia binoculars do come short. The problem is that to make these improvements, would as a matter of fact increase their production costs and so take them out of their class. So as is, they are a good pair of really cheap binoculars. 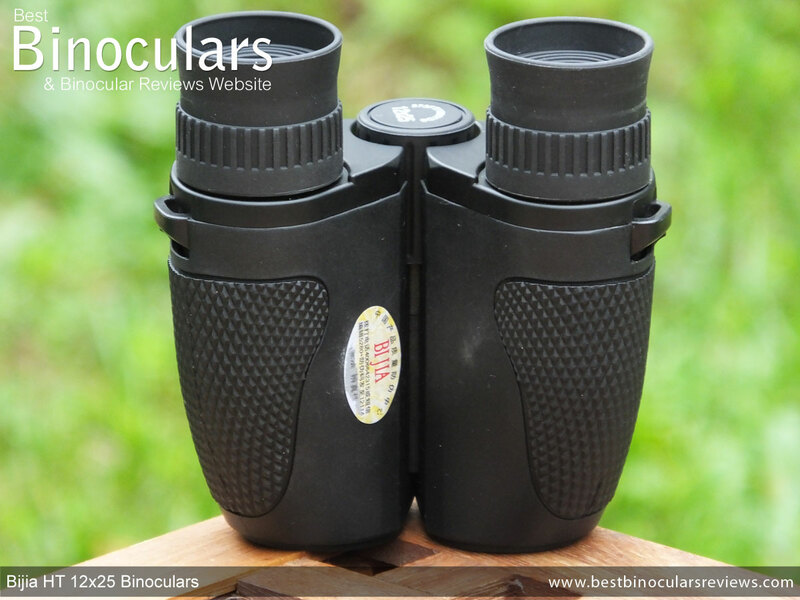 If you were to improve the quality if the glass, add some more coatings and perhaps some twist-up eyecups with more eye-relief etc, they would not doubt be a better binocular, but they would also be a more expensive binocular. I'd like to firstly stress that as with every one I write, this Bijia HT 12x25 binocular review is my completely honest opinion of them which I arrived at after thorough research, testing and use.